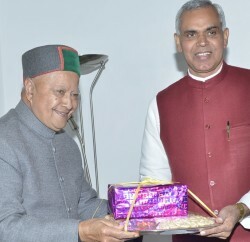 Chief Minister Virbhadra Singh presided over the Silver Jubilee function of Himachal Pradesh Secretariat Employees Cooperative Thrift and Credit Society Limited, Shimla here today. 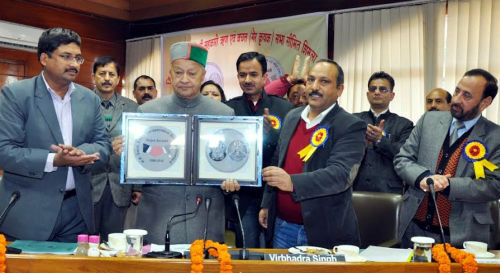 On the occasion Chief Minister released a commemorative Silver Coin of the society besides ‘Sabha Geet” adopted by the Society. He appreciated the efforts of the society for running the cooperative efficiently for the welfare of Secretariat employees. 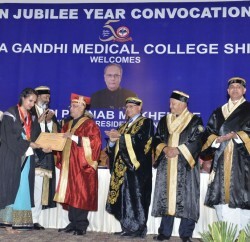 He complemented the office bearers and members of the society for serving the employees since past twenty five years. He said that Co-operative Societies were being working in almost all the departments and catering to the financial needs of the employees. 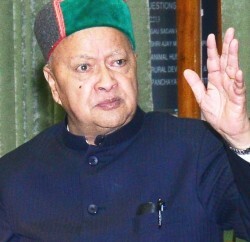 Virbhadra Singh said that cooperative societies were playing laudable role in boosting the rural economy besides strengthening the public distribution system in the State. He said that the Government was committed to strengthen the co-operative movement in the State. Earlier, Sanjeet Sharma, President of the Society welcomed the Chief Minister and apprised about the activities of the Society. R.D. Nazeem, Registrar, Cooperative Societies, Pradeep Pathania, Vice President, Upmanyu Verma, General Manager and other members of the Society were also present on the occasion.